An example of estimating sources from noisy data. Independent component analysis (ICA) is used to estimate sources given noisy measurements. Imagine 3 instruments playing simultaneously and 3 microphones recording the mixed signals. ICA is used to recover the sources ie. what is played by each instrument. 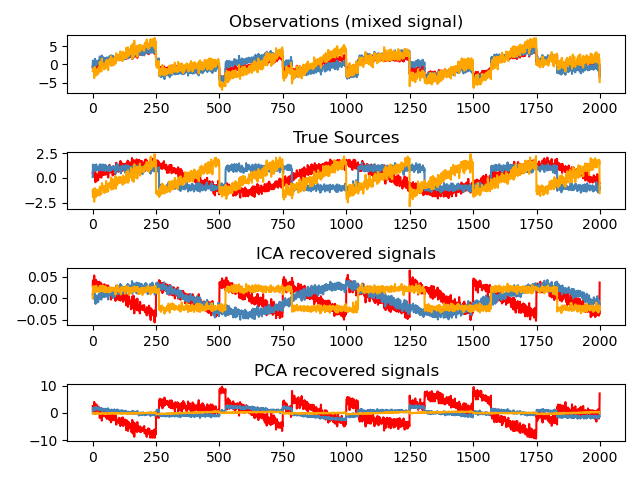 Importantly, PCA fails at recovering our instruments since the related signals reflect non-Gaussian processes. # We can `prove` that the ICA model applies by reverting the unmixing.